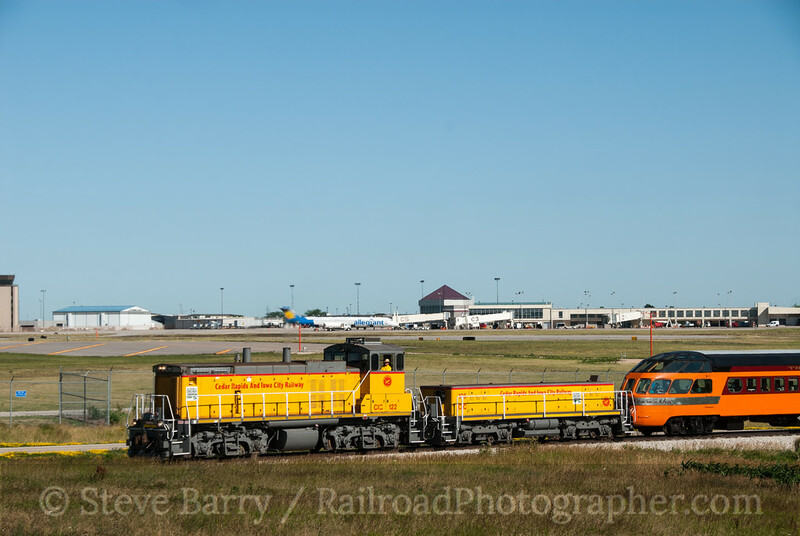 This is Part 4 of what started out as a four-part entry on a trip to the Midwest to visit Kansas City and St. Louis before heading on to the convention of the National Railway Historical Society in Cedar Rapids, Iowa. However, the week of the NRHS Convention produced so many great photos that we're going to break out the Convention separately and make it a five-part story. In Part 1 we headed west towards Kansas City and in Part 2 we took a look around K.C. In Part 3 we spent a day in St. Louis and then headed up to Chicagoland, where we left off waiting for the NRHS special between Chicago and Cedar Rapids. We pick up our story there. 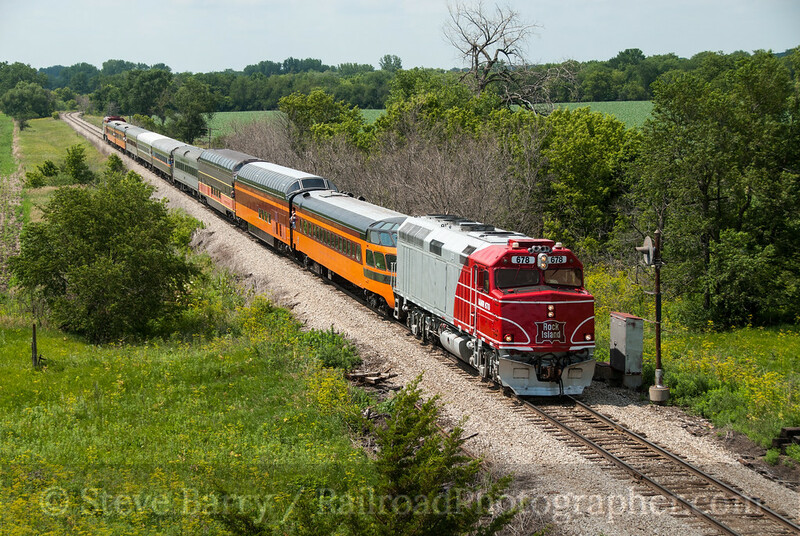 When last we met, we were waiting at Geneva, Ill., for the Inbound Convention Special of the National Railway Historical Society, operating from Chicago to the NRHS Convention city of Cedar Rapids, Iowa. Standing trackside with me on June 17, 2012, were my brother Bruce, Frank Ferguson and Mike Burkhart. The train was very late leaving Chicago, which didn't bother us much, as it only made the light better at our location. The barn at Geneva is a favorite prop for photographers along the former Chicago & North Western (now Union Pacific), and despite its bucolic appearance, suburban sprawl is prevalent to the east (just beyond the intersection in the above photo). Given the ex-C&NW heritage of the railroad, Union Pacific graciously added its C&NW heritage locomotive to the front of the train. As it got later and later, we got antsier and antsier. Then suddenly the train popped out from under the intersection and we got our shot (above). 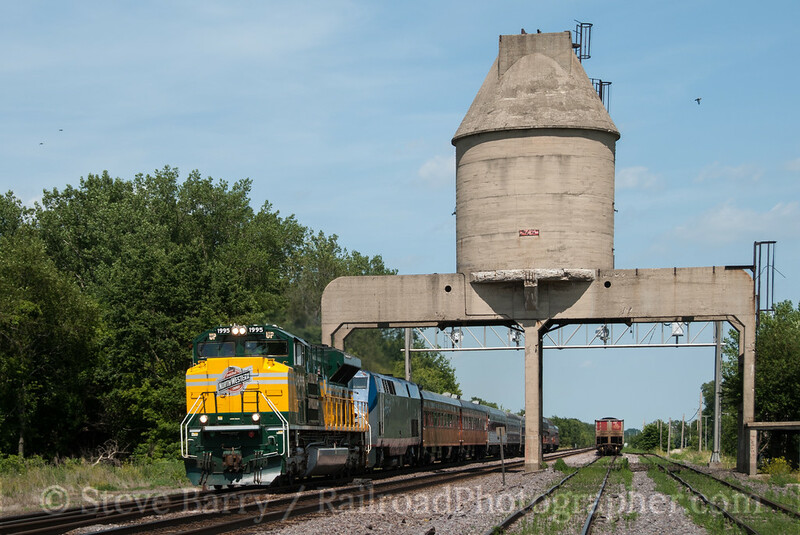 We then hopped in the car and drove about 70 miles on the interstate at speeds that challenged the speed limit, then popped into the old coaling tower at Nelson, Ill., beating the train there by mere minutes. Had the train not encountered an equipment defect that needed to be checked near Rochelle, we might not have beat it to Nelson. Another mad drive into Iowa (we had to take the long way around to take advantage of the interstates, while the train took a more direct route through Clinton) and we beat the train by a minute or two at Calamus before breaking off the chase and heading into Cedar Rapids. The first day of the NRHS Convention found bus loads of people heading south from Cedar Rapids to the Midwest Old Threshers near Mount Pleasant, Iowa. The Threshers operate a large steam farm equipment show on Labor Day weekend each year that brings in thousands of visitors. To move the visitors around they have an independent trolley system, the Midwest Electric Railway, that serves the vast RV parking area and an independent steam railroad, the Midwest Central, that circles the display grounds. Since the hills are covered with RV's during the event, this special day of operations allowed for photography without campers in every scene. The star of the Midwest Central is Surry, Sussex & Southampton 2-6-0 No. 9 (above), built by Baldwin in 1891 for the Virginia short line. The locomotive now runs on the mile-and-a-quarter loop around the Threshers' grounds, and there are a lot of scenic props along the line for photography, including a small village of vintage buildings. 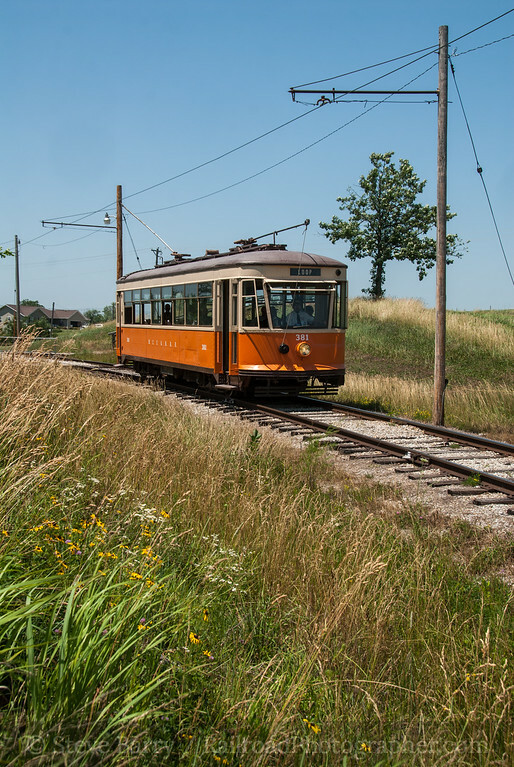 The Midwest Electric Railway operates a 2.5-mile loop around the RV parking lot and uses an eclectic mix of Iowa streetcars and cars from Chicagoland (a mighty fine heavyweight interurban from the Chicago, Aurora & Elgin) and around the world (one car each from Italy and Brazil are on the roster). Iowa cars include a Southern Iowa Railway express car and a Waterloo, Cedar Falls & Northern "safety car" (photo above) built by Perley Thomas in 1930 that originally operated in Knoxville, Tenn. 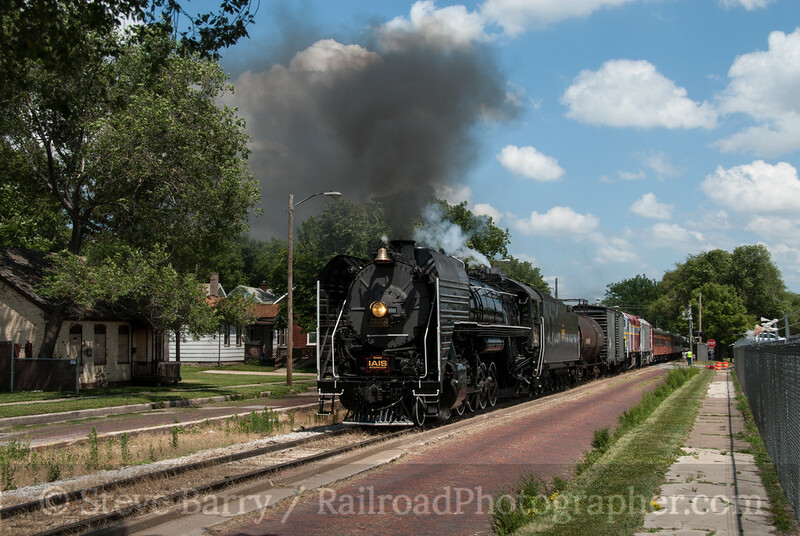 The return trip from Rock Island was powered by IAIS's 2-10-2 Chinese-built QJ-class steam locomotive No. 6988 (built in the 1980s). 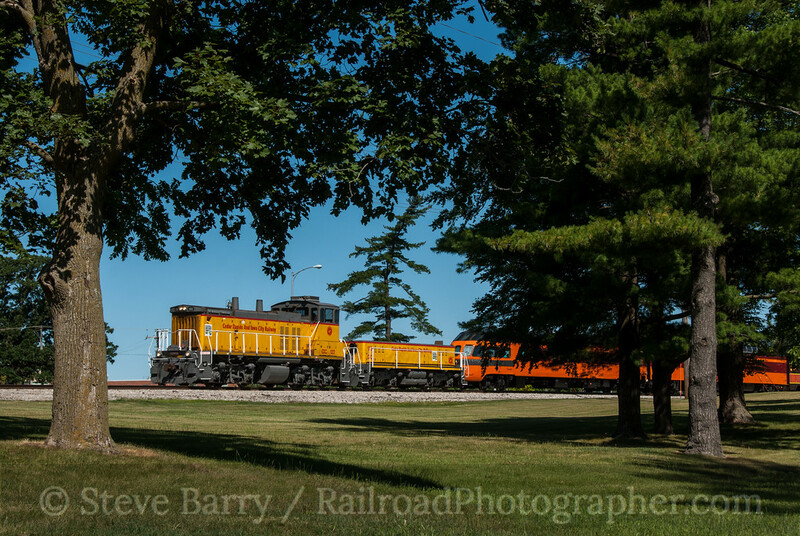 Lunch and a couple of photo runbys were held on the median/street running in a residential area of Davenport before the train made its way back to Homestead, where the steam locomotive was removed, then on to Cedar Rapids. Once the train had returned to Cedar Rapids and everyone had dinner, buses returned about 50 photographers back to Homestead for a night photo session with QJ 6988. 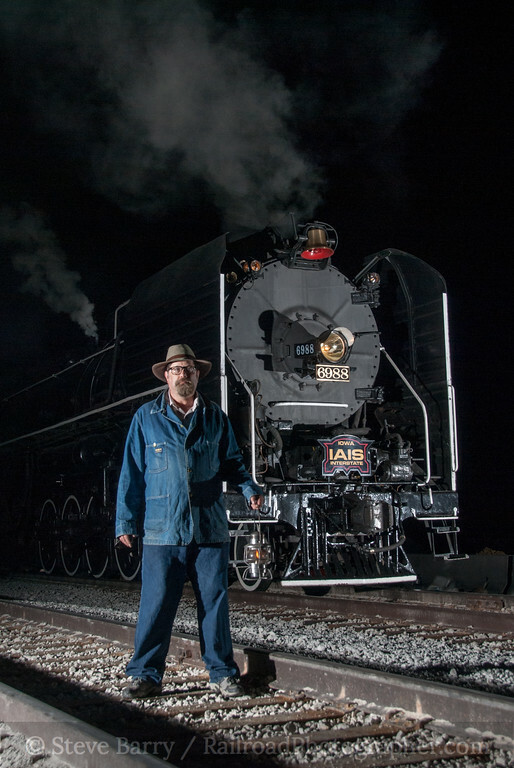 With the locomotive tied down for the night, construction for IAIS's new shop complex occupying one side of the scene and no other locomotives in the complex, the "standard" night photo shots were limited to just one. 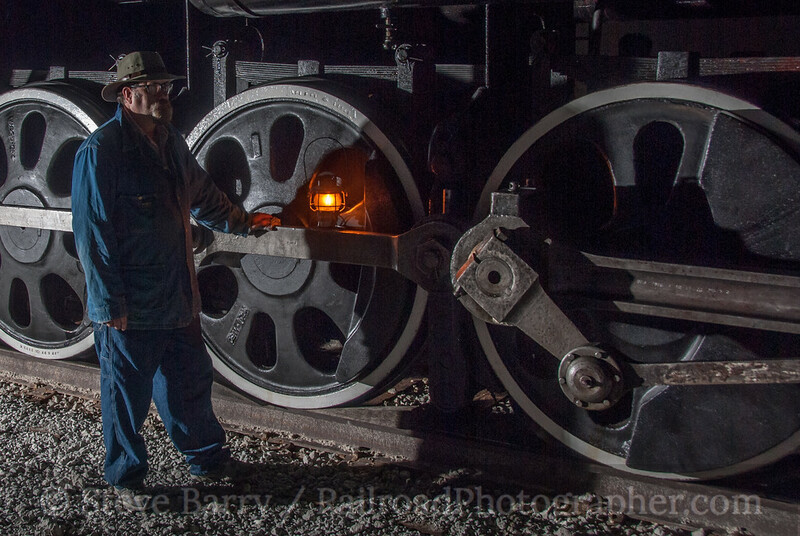 But with a little creativity (and some help from railroader Ray Saunders, who posed for a couple of scenes, some pretty dramatic imagery was made. It was then back to the buses for the ride back to Cedar Rapids. Wednesday's schedule had the train leaving Cedar Rapids and heading south to Homestead once again, but this time the train would go west on the old Rock Island, bound for Newton, Iowa, behind the 6988. 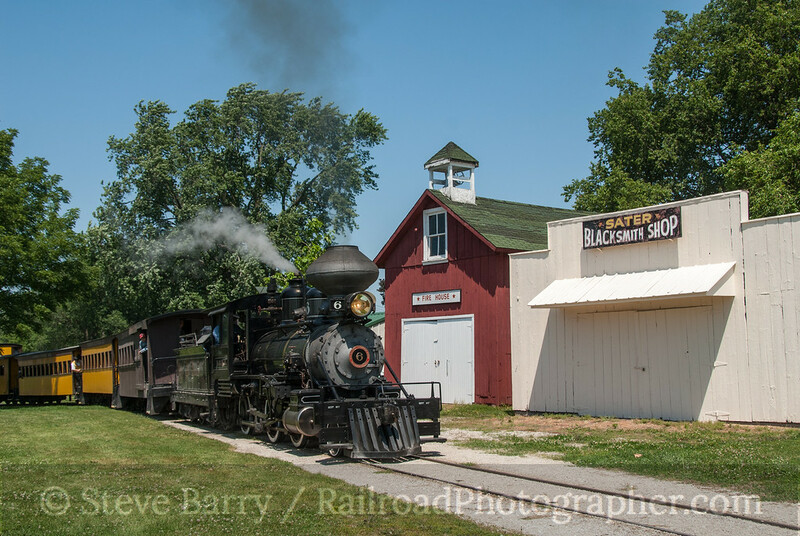 Since the light would be bad in both directions for photography, we decided to do regular service railroading (and a visit to some Lincoln Highway historic sites). Thursday saw buses heading to Boone, Iowa, for a visit to the Boone & Scenic Valley, but I had NRHS business to attend to (I'm on the Board of Directors), I had to miss that trip. Friday's trip covered the rare mileage of the Cedar Rapids & Iowa City (CRANDIC) between its namesake towns. 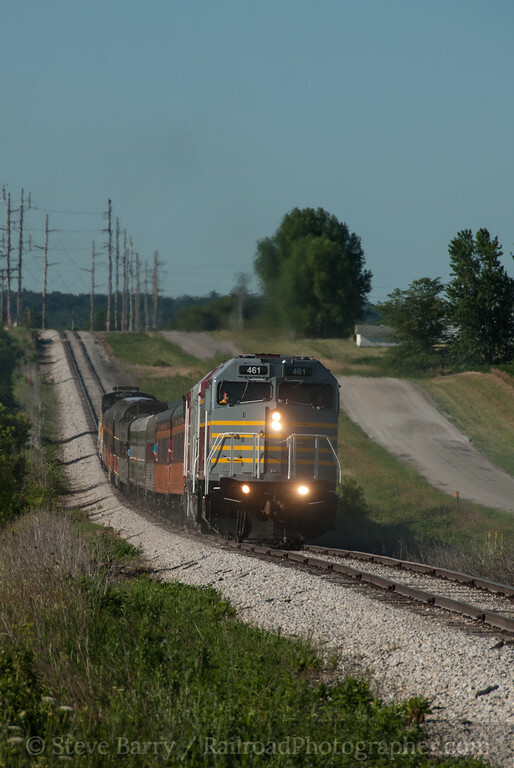 The trip originated at Swisher, just south of Cedar Rapids, with Iowa Northern F40PHR No. 461 and F40PH No. 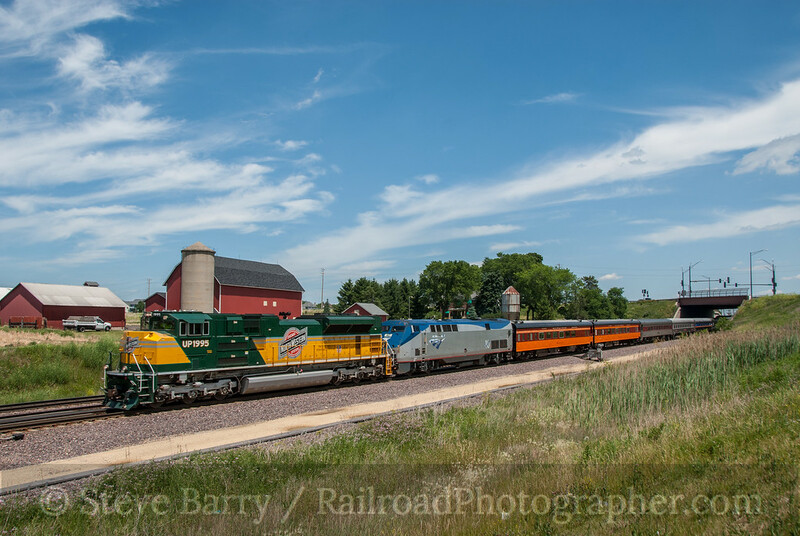 678 (in a Rock Island tribute paint scheme) leading the train north on a roller coaster profile (left). The train proceeded through the sprawling Archer Daniels Midland plant in Cedar Rapids before reversing direction, now with CRANDIC MP15DC No. 122 leading slug No. 125. Heading south, the train passed the Eastern Iowa Airport (below). The trip paused at Oakdale for a photo runby (lower photo) where trees formed a frame or you could shoot in an open field. After arriving in Iowa City, just barely crossing the Iowa River, the train reversed direction and the two Iowa Northern diesels led the train back to Swisher. 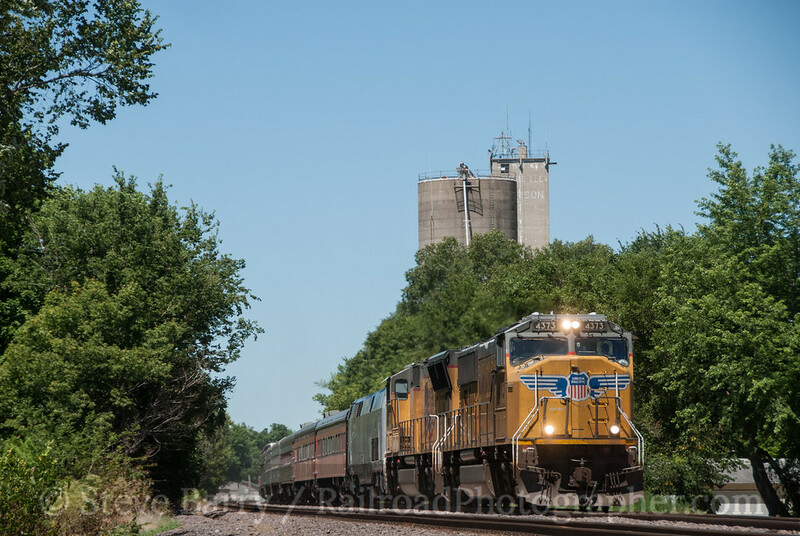 Saturday's trip operated on the Iowa Northern from Cedar Rapids to Waterloo, with a stop at the Iowa Northern's shop at the destination. Since the weather was marginal on this day, I opted to spend the day on board, enjoying the ride in a deluxe coach. The trip had IANR's two F40s for power, with No. 461 on the north end and No. 678 on the south end. The configuration was the same for Sunday's trip, which originated in Cedar Falls (not Cedar Rapids) and went to Manly. I enjoyed the ride in Skytop lounge Cedar Rapids (appropriate for this convention) on the northbound trip, then chased the southbound trip back. 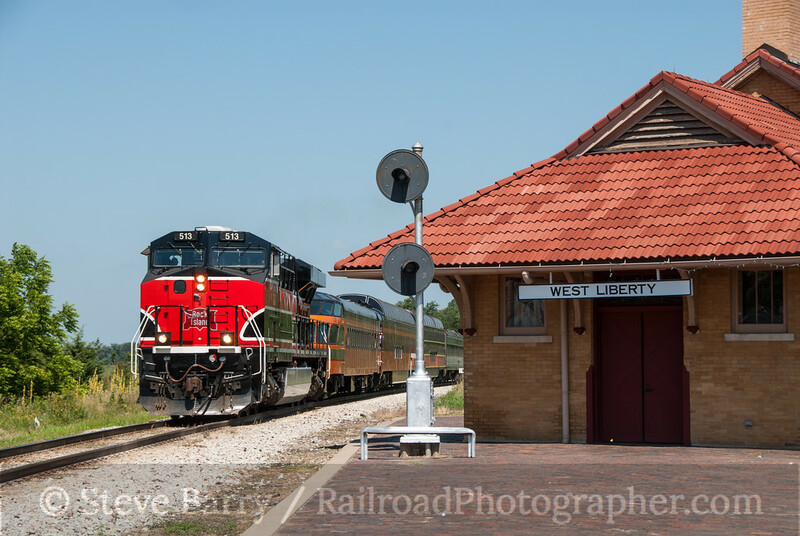 Has had been the practice for most of the week, we were on ex-Rock Island trackage and photo opportunities included getting the Rock Island heritage unit passing decommissioned Rock Island signals near Nora Springs. As the day wore on, the sun swung around allowing for "going away" shots of the southbound 461 on the north end of the train. 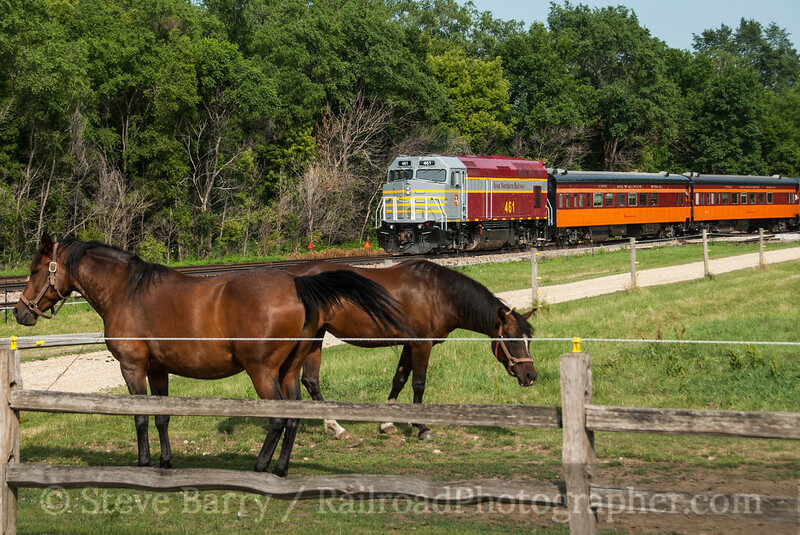 The horses at Shell Rock seemed unfazed by the passage of the passenger train and the four photographers trying to figure out how to shoot them and the train in the same frame. Arrival in Cedar Falls and the bus return to Cedar Rapids brought an official end to the Convention. There was, however, an outbound train back to Chicago for attendees who had come in on the inbound train a week earlier. This time there was no Chicago & North Western heritage unit leading -- UP simply pulled a regular (and not quite clean) locomotive from the freight pool. We set up for one shot just across the Mississippi River in Morrison, Ill., and then let the train speed away. We would work our way across Illinois at a much slower pace. While in Iowa, there was plenty to see away from the NRHS Convention. We'll recap those highlights, plus head eastward, in the next installment.